According to Google Insights for Search, which examines the past values for the terms you've entered, can be used to help you forecasts, and make predictions of future terms (keywords). 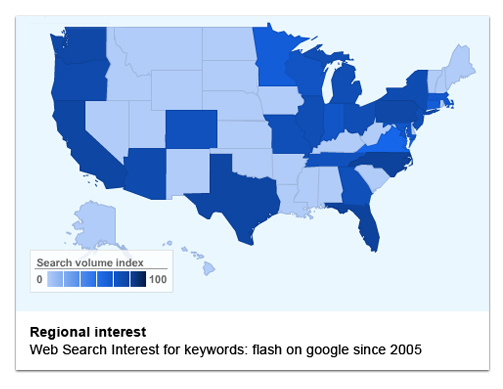 As far back as April 2005 the terms "Flash on Google" have consistently grown in popularity from a mere 13% interest to 82% interest as of the date of this article. Predictions for searching these same terms is predicted to steadily increase. Edelman Inc. (Edelman is the world’s largest public relations firm, with 63 offices and more than 4,200 employees worldwide, as well as affiliates in more than 30 cities. ), Lisa Auslen of San Francisco talks about Adobe's reaction to Apple's lack Flash – Lisa highlights the benefits of Adobe's CS5 and Flash technologies. Why then are there website developers and people in general still saying things like "Google can't read Flash," or "Flash® is not good for Search Engine Optimization," or "Flash® is too hard to update." The primary reason is, those website developers are not trained in Flash® development, HTML is easy to copy and resell as their own code, and lack of research on the topic. The truth is Adobe® Flash® is not difficult for those well trained and experienced in Flash® website development. The most intuitive and creative websites use Flash® to offer visitors more options and interactivity than possible with basic or even advanced HTML / HTML5. With Google holding 65.1% (9 billion out of 13.8 billion searches) of the U.S. search engine market, and the next closest Yahoo! holding just 16.1% (2.6 billion searches), it's very important that you know the truth about who can see or not see your website on Google. So what is the truth about Flash® on Google? Flash® is just as, if not more visible and valuable to search optimization on Google. With proper Flash® website development, Google has the ability to drill into website built with Flash® software. No long-winded answers. Just the facts. Included in this article are recent screen captures that show Google search results for a small Flash® website built by an experienced Flash® website developer. Notice how the Google search results have extracted the website navigation button names, and keywords that attract visitors to the products being sold. 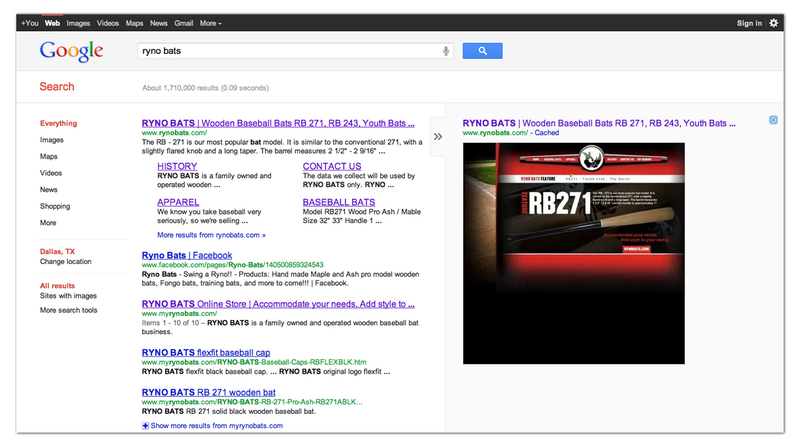 Google has even captured a picture of the website homepage in full color, just as clear as any HTML website.